Club events are a fun way for students of The French Culinary Institute to enhance their education while getting to know classmates, exploring New York's vibrant food culture, and visiting a variety of restaurants, farms, and wineries around the area. On December 1, The FCI's Forager Club gave students the opportunity to meet and eat with David Sax, author of Save the Deli and journalist for The New York Times, New York magazine, Vanity Fair, GQ, and more. The self-proclaimed deli fanatic hosted a Jewish Food Noshing Tour of NYC's Lower East Side. 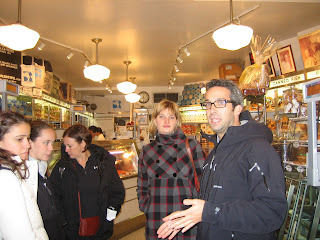 David led the group to some of the most authentic Jewish food New York has to offer, including bialys from Kossar's, the oldest bialy bakery in the United States, Yonah Schimmels' famous "Downtown Knishes," and the destination pastrami sandwich from Katz’s Famous Delicatessen. 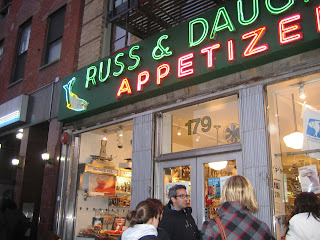 The group also enjoyed a smoked fish tasting at Russ and Daughters, the nearly 100-year old institution deemed part of New York's cultural heritage by the Smithsonian, excellent kosher pickles from The Pickle Guys, and pastries from Moishe’s Bakery to top it all off.